Happy Monday! I am relishing in the fall air that arrived in Maryland this past weekend and appears to be here to stay awhile. Fall is my absolute favorite time of year, and I truly feel my home smile and revel in the beauty of the season as well. 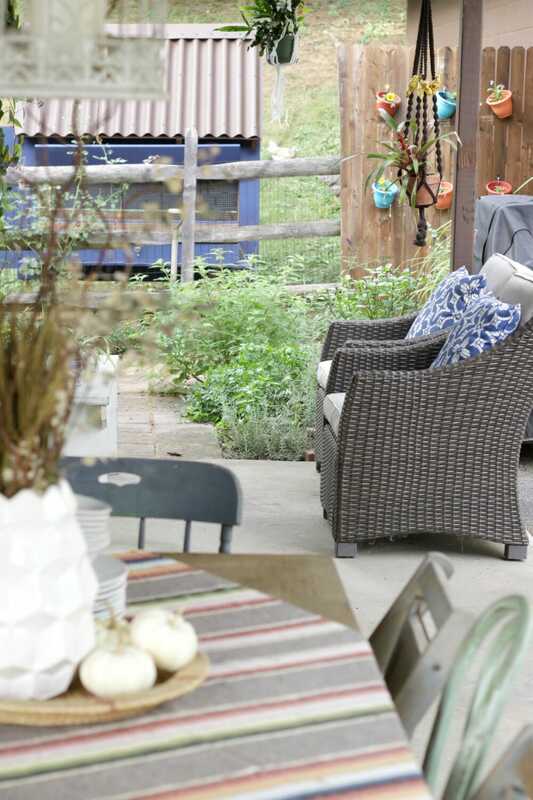 Because of my love for all things Fall, I am excited to share with you today my bohemian fall porch and brunch setting as part of Lindsay’s Blogger Stylin Home Tours fall edition. If you are visiting from Lindsay‘s, welcome! What a load of pressure an honor to follow the hostess herself on this lineup. We have a large wrap around porch with amazing views as the house sits on the top of a hill. Not surprisingly, it’s one of the features that initially drew me to the property 5 years ago. I thought we’d start with what is officially the main entry, although it’s not the one we typically use. On the bench itself I’ve laid a cozy sheepskin and a mix of heirloom pumpkins and gourds as well as decorative cabbage and an awesome little fern I found for $1. You might be thinking, well, Cassie, how on earth do you sit to take your shoes off with those pumpkins on the bench? And I would tell you that no one ever uses this door, so this little nook is really just a place I get to express my style. 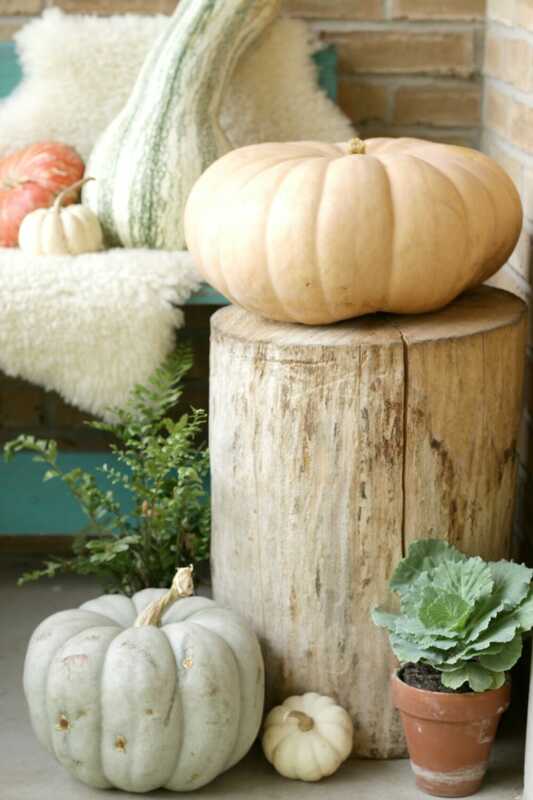 I love the way the large pumpkin looks perched on my stump. It certainly suits the natural vibe I mentioned I was going for this year both inside my house and outside. I’ve also added a giant spider plant that my landlord at Sweet Clover gave me. I happened to see it on her porch and mentioned how beautiful it was… she told me it was so big and needed a new home. My hand went up in the air and I offered this plant its forever home here on the hill. The coziest seat on the porch sits at the corner, in between this entry, and the area that serves for dining and entertaining. We all love to curl up in the hammock and read, relax, sip wine or coffee… it’s the best seat in the house. 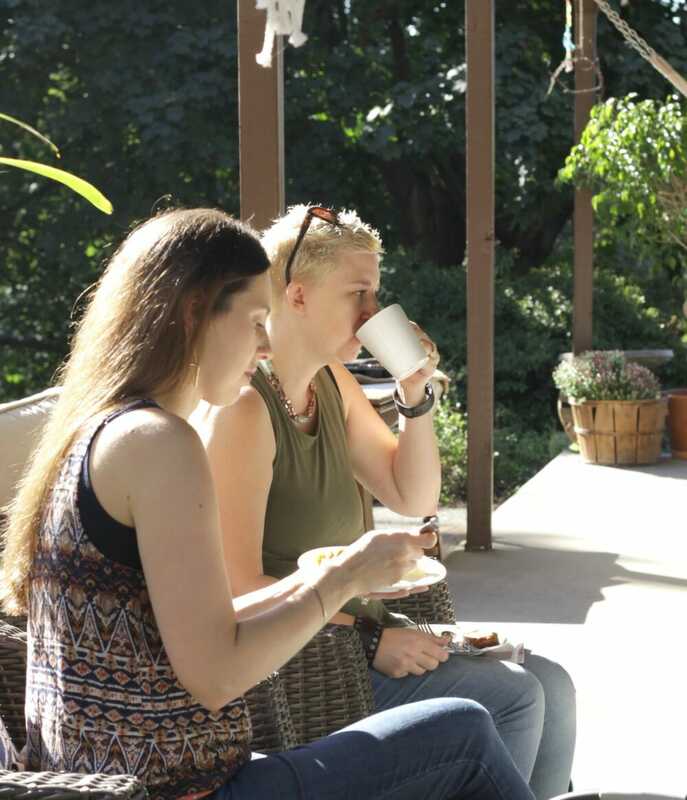 Our porch continues around the house, and the side area serves as outdoor dining (where our family gathers often) as well as a conversational area. To give you a little perspective, here’s the side of our little Cape Cod. 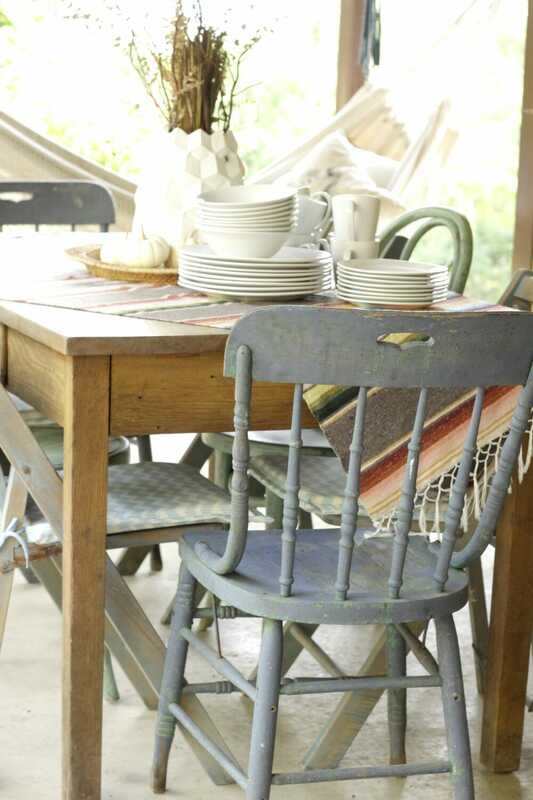 In keeping with the eclectic feel I prefer, the dining area has newly mixed seating, all vintage chairs in blues and greens. These colors are always my favorites, and I am really happy with this arrangement at the moment. Our porch, just like the rest of our home, has evolved over time. 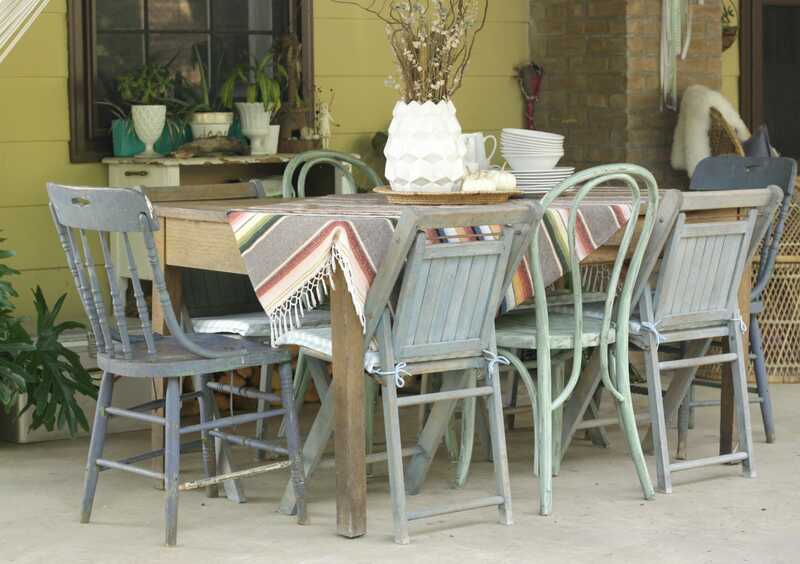 This area of the porch is always ready to entertain or become the setting of our next meal. 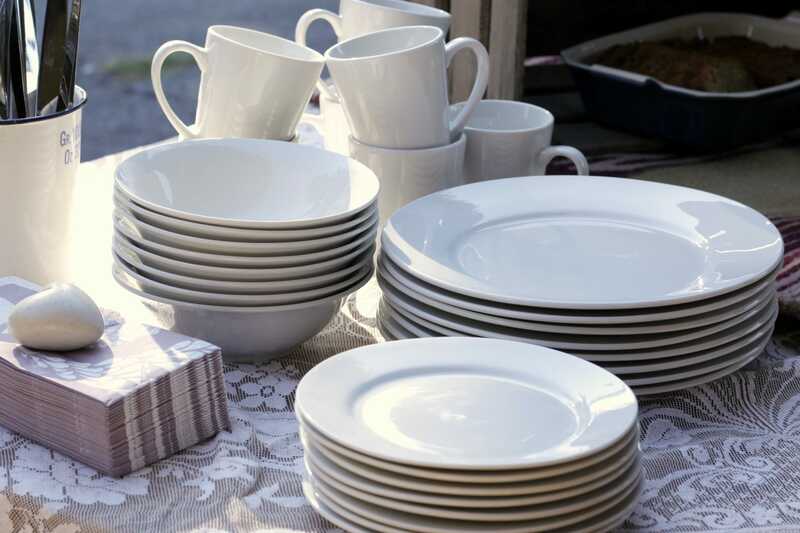 The simple white dishes from Gordmans are the perfect dining ware with so many other colors and textures going on. I created a centerpiece using branches I found in a brush pile on a walk almost 5 years ago, dried eucalyptus from my herb garden, a wheat bundle, and added an ear of Indian corn to provide fall color from the husk. As you can see, it was a later addition and wasn’t actually in my first photos. However, I felt it was lovely and worth sharing, even if it came later! This modern white vase from Gordmans was the perfect vessel- I love that it brings in a geometric touch and clean lines. 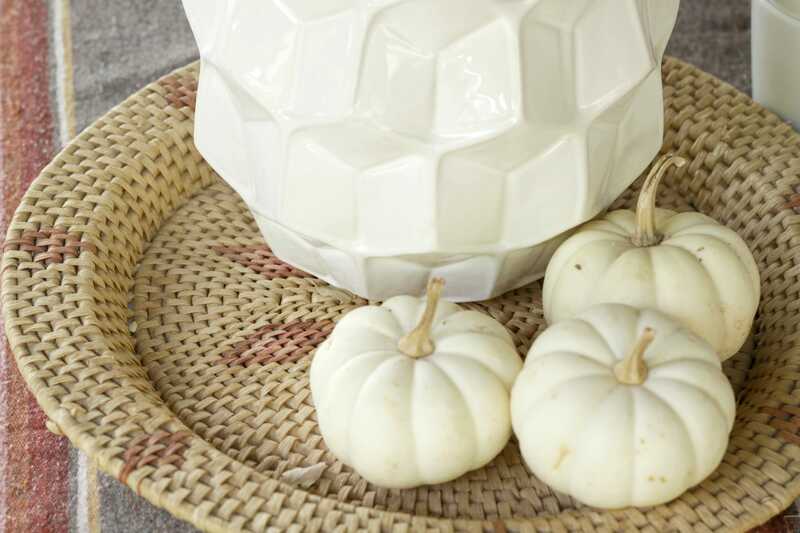 Little white pumpkins on a thrifted tribal woven basket tray complete the centerpiece. I found this tray months ago and have just been holding onto it until I had the perfect use. 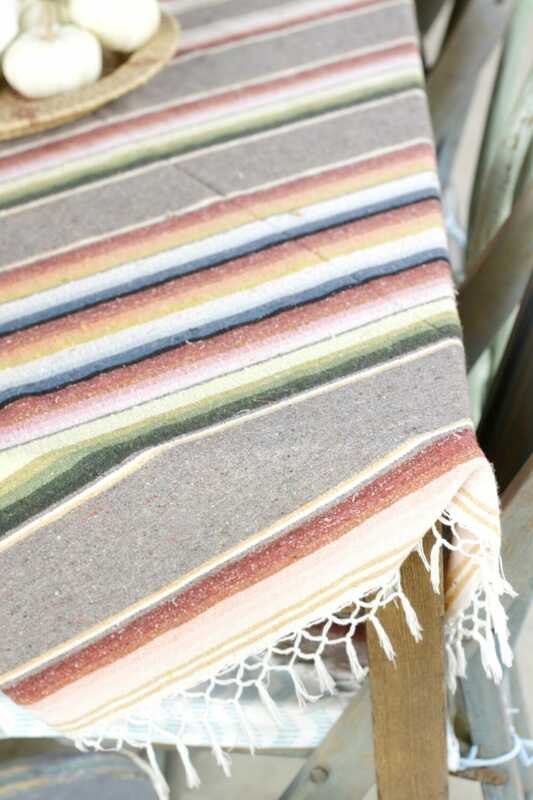 This vintage serape was an auction win and I love that its got the feel I want but the colors are more muted and suited for fall. The macrame style fringe gets me every time! If you remember my summer porch, I had a peacock wicker chair that once sat here as the end chair, but I just scooted it over to face the seating area. My chair is a vintage find, but you can find an almost identical new version here. I love how it looks here, to the left of the door we use to enter the house and wonder why I didn’t place it here before. It works perfectly as an extra chair with our seating area. We purchased the resin wicker love seat and a pair of chairs from Target a couple years ago, and they have served us well so far. 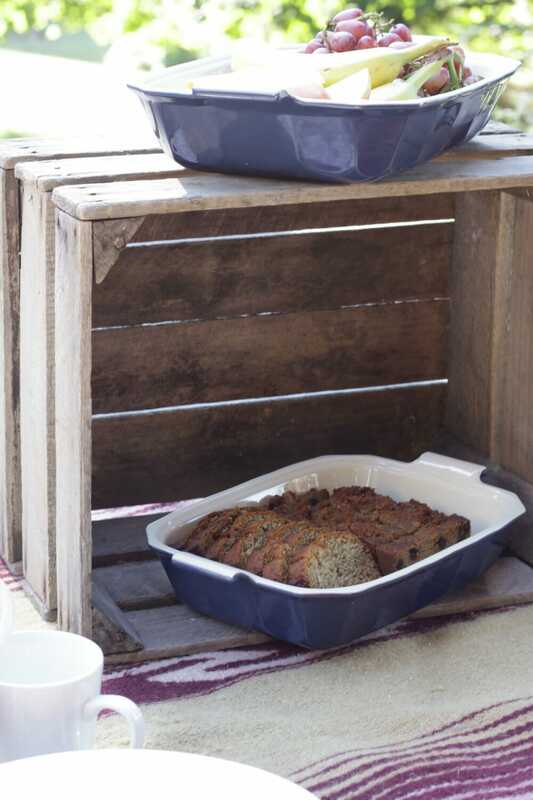 They’re comfortable and function as the perfect place to sip coffee or wine with friends. Additionally, I brought in an antique farm bench I found years ago that serves well as a coffee table in this narrow space. 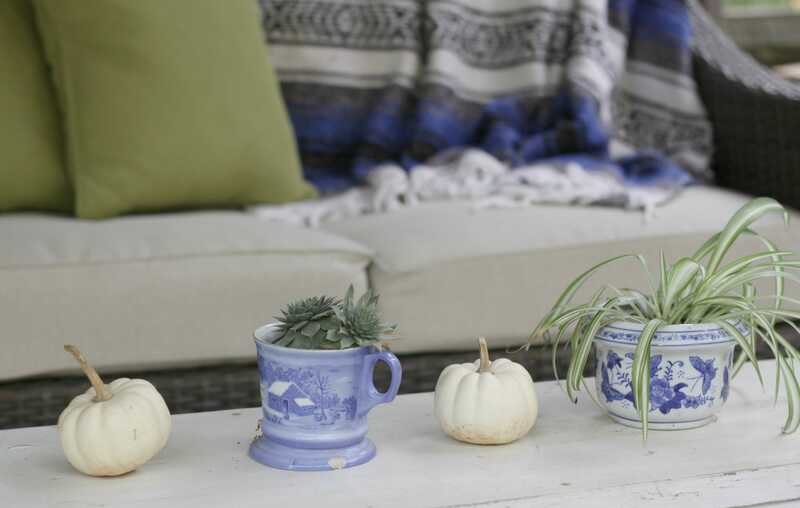 For fall, I lined it with blue and white potted succulents I already had and mini white pumpkins, which I can never get enough of because they’re just so cute! 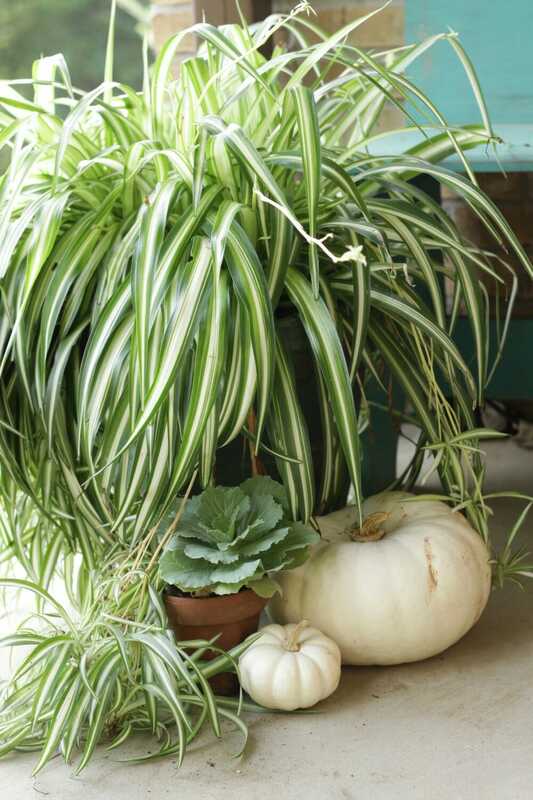 In my large planters that flank the door, my ferns are still lush and green, so I simply added some gourds and pumpkins to the mix; I love an easy touch with seasonal impact. 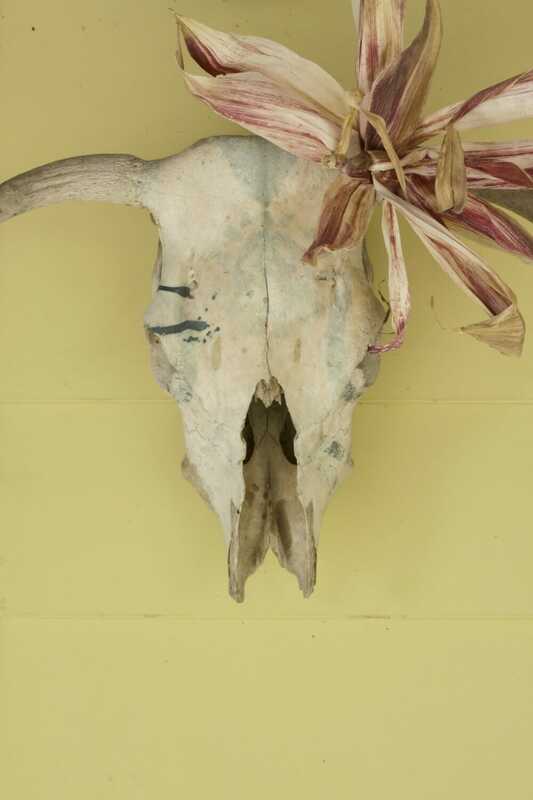 As you can see, I moved my bull skull to this door, and he received a fall addition of a flower I made out of the top of Indian Corn. I simply cut off the top, opened it like a flower, and wired it onto one of his horns. 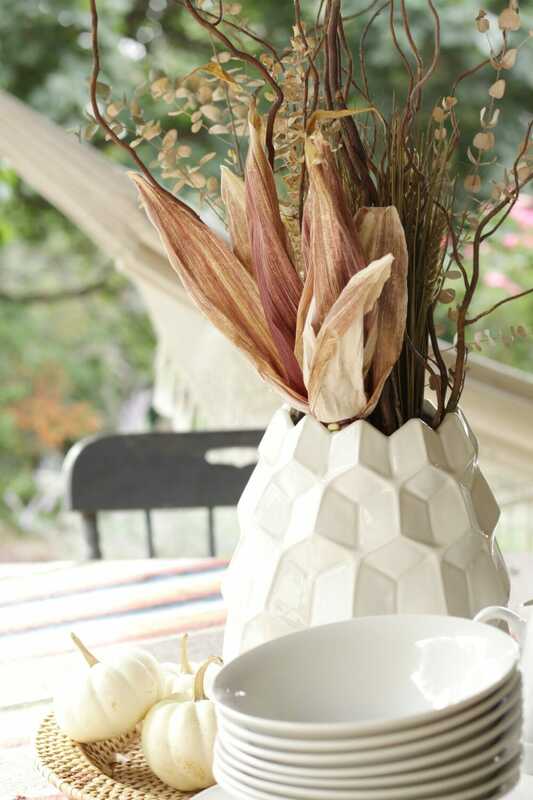 This little Fall creation might be my favorite on the porch at the moment. Off the back of the porch is our herb garden which flourished this summer. 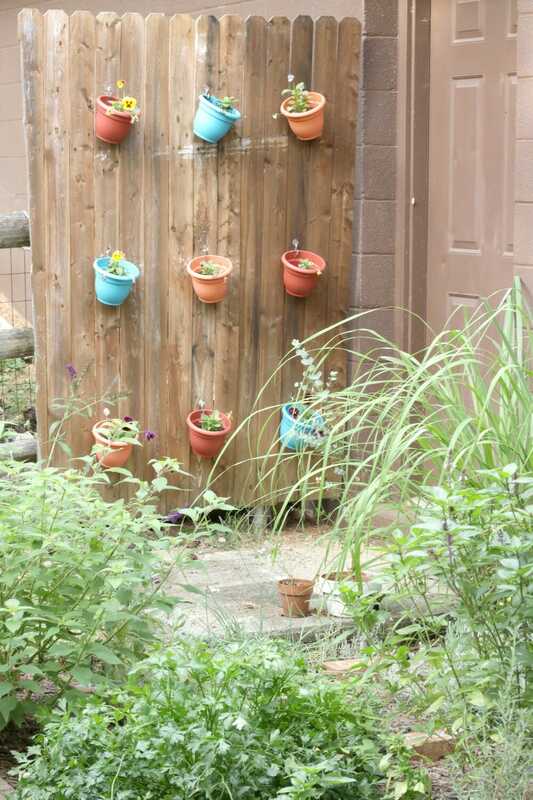 I added colder weather flowers, pansies, to the planter wall behind it. This photo was actually taken after I had already used much of our basil and dried several herbs, but you can still see our sage, parsley and lemongrass going nuts! 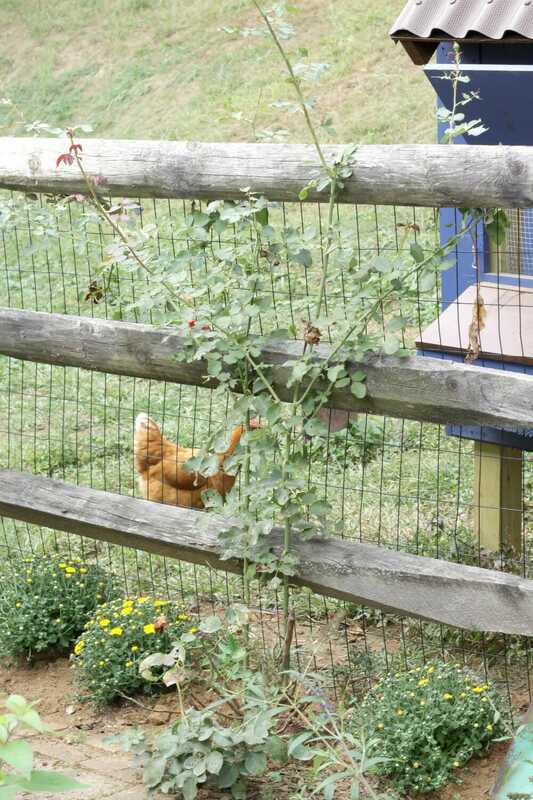 To the left of this is a walkway with pavers that leads to our back yard, where our chicken coop sits. I planted some mums I found at Costco… 4 plants for $11.99! 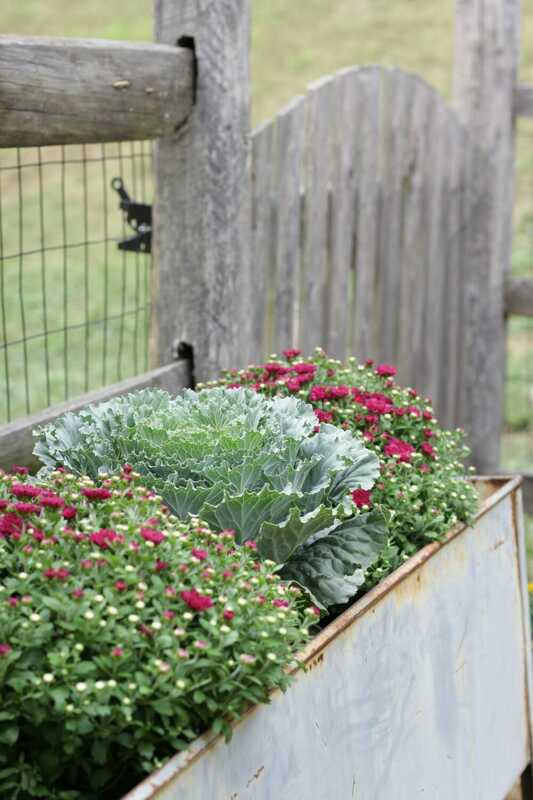 To the left of the gate into the back yard, I have a vintage industrial bin that we use as a planter. For the season, I’ve added 2 mums and an ornamental cabbage. They’re just sitting in their pots in the planter as I’ll be planting the mums int he ground eventually. Because this space makes me so happy right now, I wanted to share it with friends. A few years ago, we used to entertain so much more… New Year’s parties, Labor Day cookouts, even a Memorial Day kegger. 😉 But over the past few years life has been so much busier, and I haven’t had the time to plan these kinds of events. 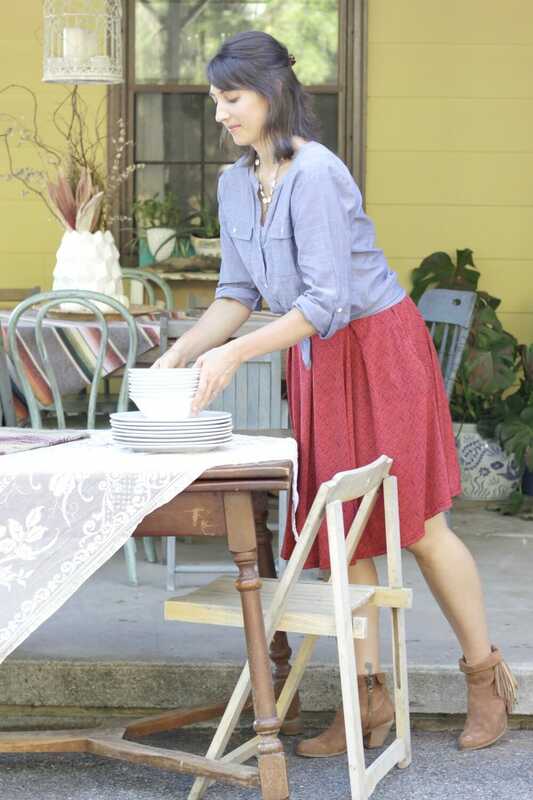 When I have had the time, I haven’t had the desire to host… the thought of getting my house totally clean and cooking and entertaining was daunting. I’ve decided it’s time to change all of that, and I opened up my porch to brunch with some girlfriends. I pulled a table out of my garage to use as a buffet table, and it worked out perfectly. 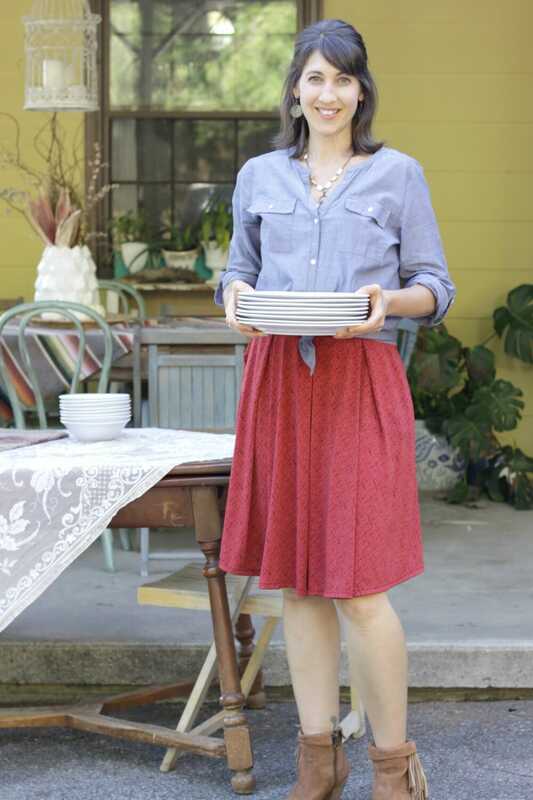 I moved all of the dish ware, added utensil in an enamel pitcher, and a crate to give me layers to serve food. To help hide the stains and blemishes on the table but also bring in that bohemian fall feel, I layered my great grandmother’s lace tablecloth and a navajo saddle blanket. They offered great texture and a but of color as well. I imagined that everyone would sit at the table and chairs to eat, but many of my friends had little ones with them (which was SO much fun for me!) and they played in the back yard with the chickens and on the trampoline while we sat in the seating area and munched and chatted. Some of the little ones enjoyed sitting at the table and feeling like big kids, and some of the kids enjoyed the peacock throne. We had a great group of women who were all meeting for the first time, and the mix was so fun! We all bonded over design, rural living and kids. Two of my friends pictured below you might recognize; Laura is a designer and recent mom to baby Chloe, and Emy is a local creative DIY blogger who joined me in Dollhouse Therapy. 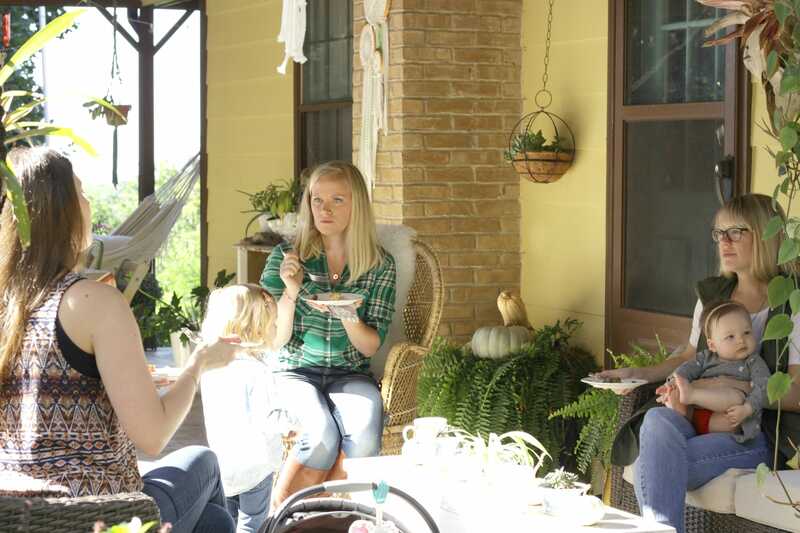 Having all of these wonderful women on my porch, I realized how much I truly love having people gather in my home. I am already planning the next get together! Hosting also gives me a reason to dress in something other than spandex. 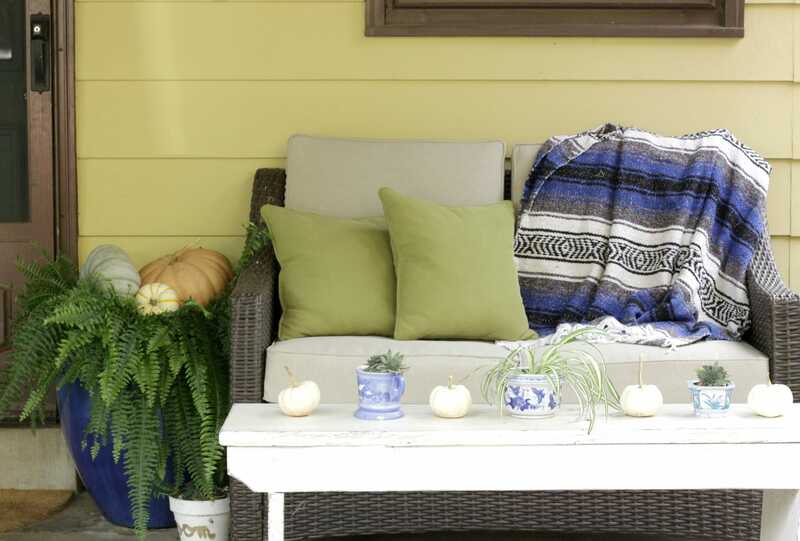 Thank you so much for visiting my bohemian fall porch today! My home is far from done and far from perfect, but it doesn’t have to be in order to be a cozy and welcoming place to gather with friends and family. Happiness comes not from order and cleanliness and the things you have, but the relationships with the people you can spend time with at home. Now I hope you will head on over to Shauna’s home and see her beautiful fall decor at The House of Silver Lining. 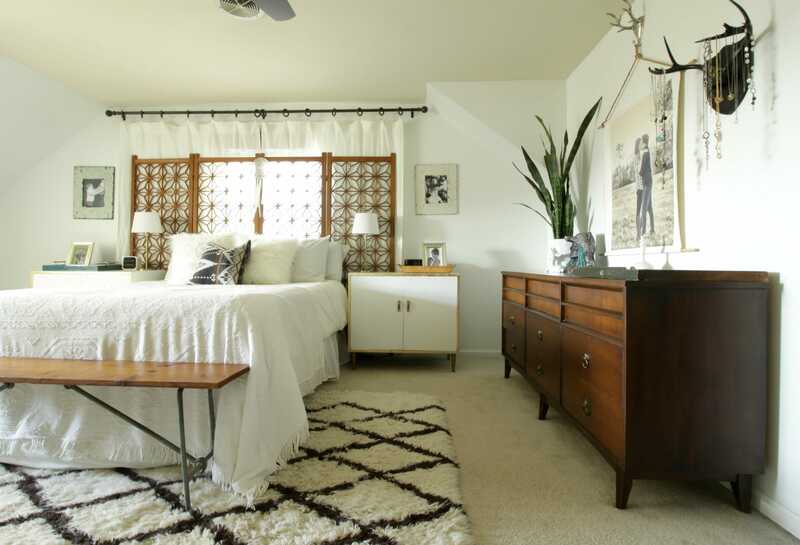 If you like a touch of glam, you are sure to love her space! And if you want to start at the beginning of the tour, head on over to Lindsay’s blog, The White Buffalo Styling Co. Happy Fall! 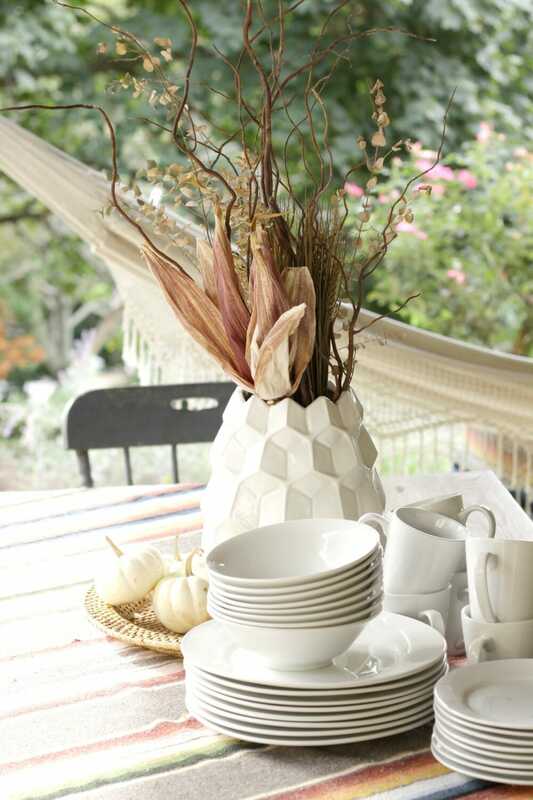 PS- If you liked the porch, check out my interior fall tour here. *This post contains affiliate links that help keep my blog alive- thank you for your support! I want to hang out on your beautiful porch too. And that corn flower skull is my absolutely favorite. Love it and such unique and different fall decor. thank you, julia! you know you are welcome on my porch any time. i would LOVE that. Hahaha! Dunkin Donuts! It was amazing. Thanks so much for having me. 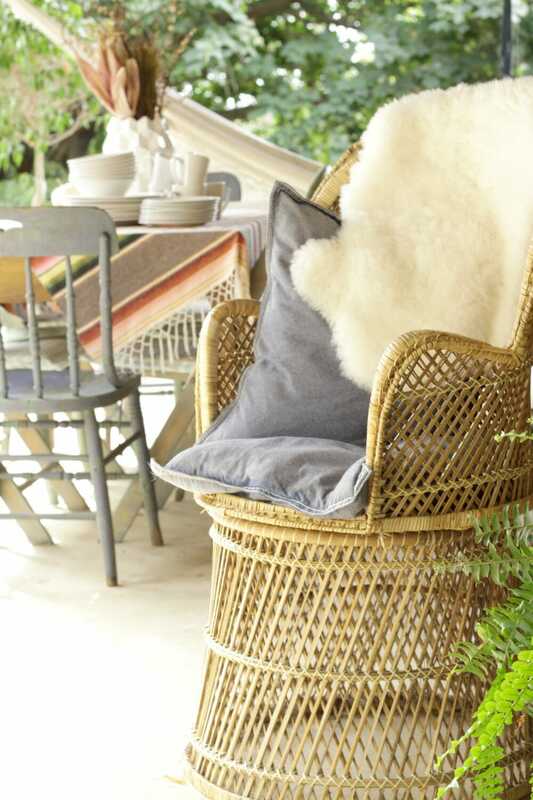 Your porch is so inviting and such a lovely place to hang out! 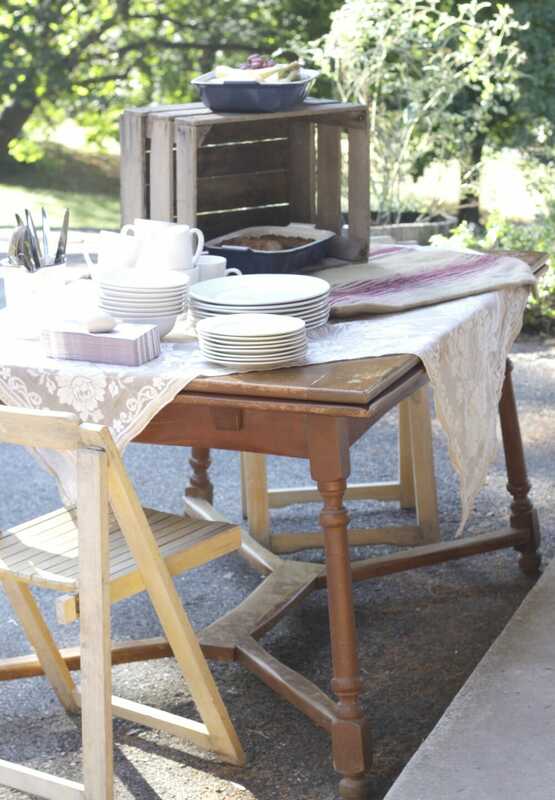 I love the mix and I’m inspired to use to a bench for a coffee table on our patio. it’s seriously the best coffee out there! 🙂 although i will also drink a good costa rican or jamaican blue mountain! Your porch looks amazing! It’s so big! What a beautiful brunch and I love your outfit too! thank you so much, heather! i appreciate it! What a treasure your wrap around porch is!! Must have been so fun to decorate and you made it look so fall-perfect! Now I’m hungry after seeing all that yummy food! Happy fall friend! thank you so much, shauna! happy fall to you, my friend! Perfectly fall! Also “so this little nook is really just a place I get to express my style.” AINT THAT THE TRUTH! that pretty much sums up my dining room. haha! it’s fun to have spaces like that to play in! Loving it all! So warm and inviting! Loved seeing pics of you too. thank you! i always feel a little silly, but luckily my photographer knows me well so that makes me super comfortable. 😉 props to emmy! such a fun and inviting space! I would have been over in a heart beat if I lived closer! 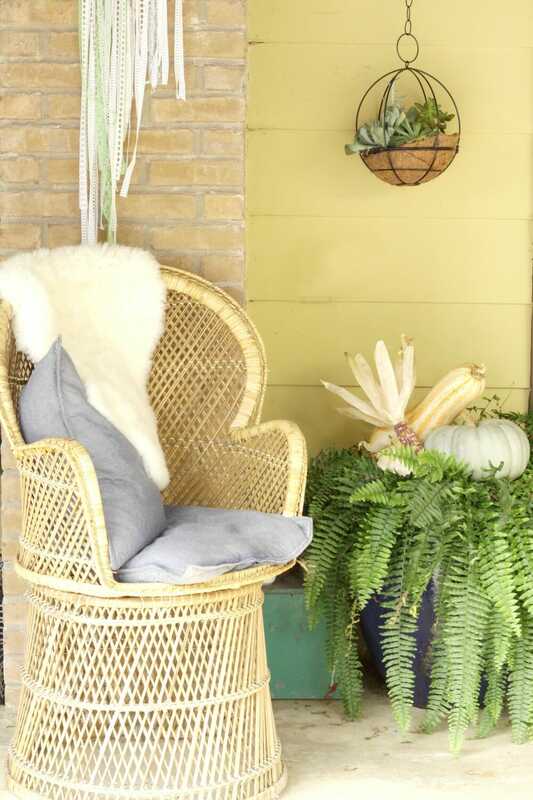 Your porch looks so inviting! 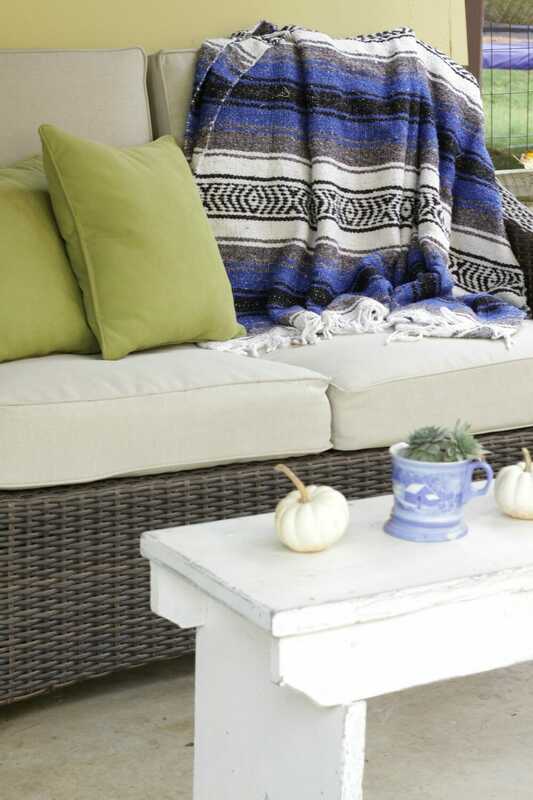 It’s got a santa fe vibe that works with the rustic and worn colours of fall. Love the arrangement in the modern vase! 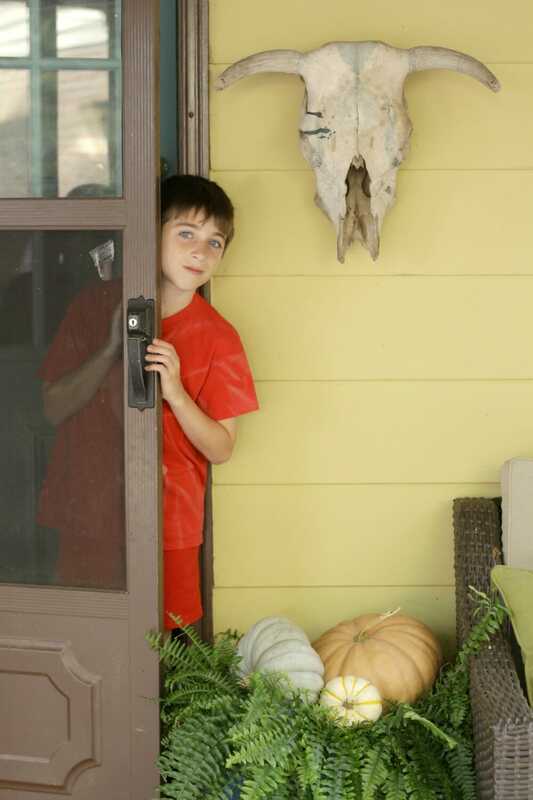 I LOVE the skull outdoors! I just passed on a few last week and now, I’m totally thinking I should go back and get them. Such a welcoming space!! thank you so much, ashley! yes go back! oh vicki, thank you SO much! i appreciate your comment! Wow, that porch is seriously amazing. What a blessing to have such a beautiful spot to enjoy with a cup of coffee in the morning! And good for you on reviving your love of inviting in friends and family, it can be hard to find the energy to entertain (I feel the same way sometimes!) but it’s always so rewarding and time well spent. 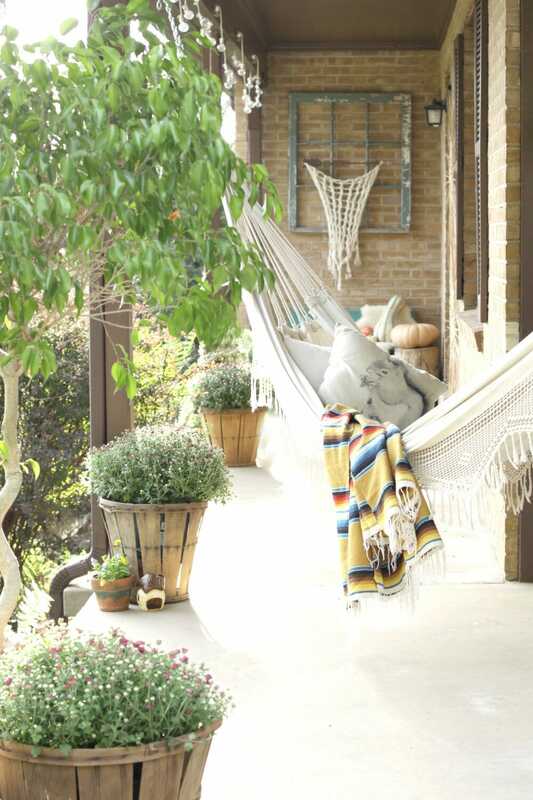 And with a beautiful porch like that, you have the perfect setting for a relaxed time together. Your home is lovely and I loved getting to know you better through your post. Thank you for sharing it! aaaw, melissa, thank you so much! entertaining truly is so rewarding and i am looking forward to making more time for it! thanks for visiting! 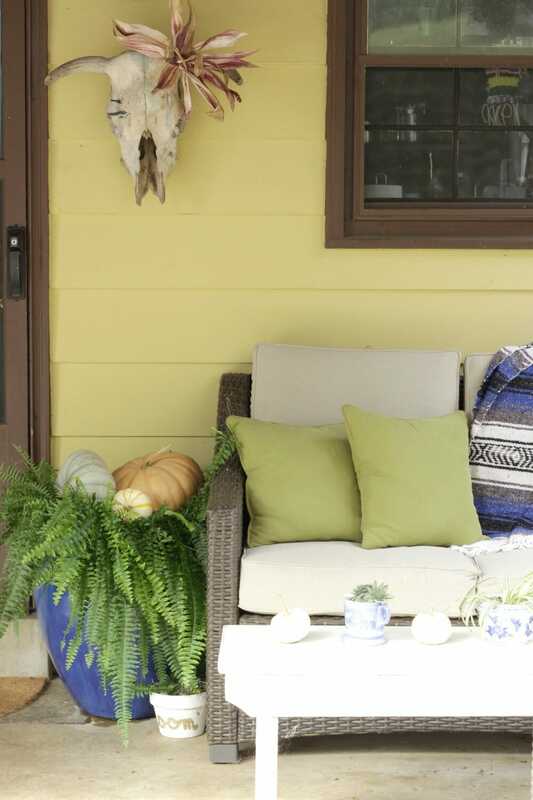 This tour just blew me away–the way you have set up your porch has so much heart and soul and is so perfect for fall. 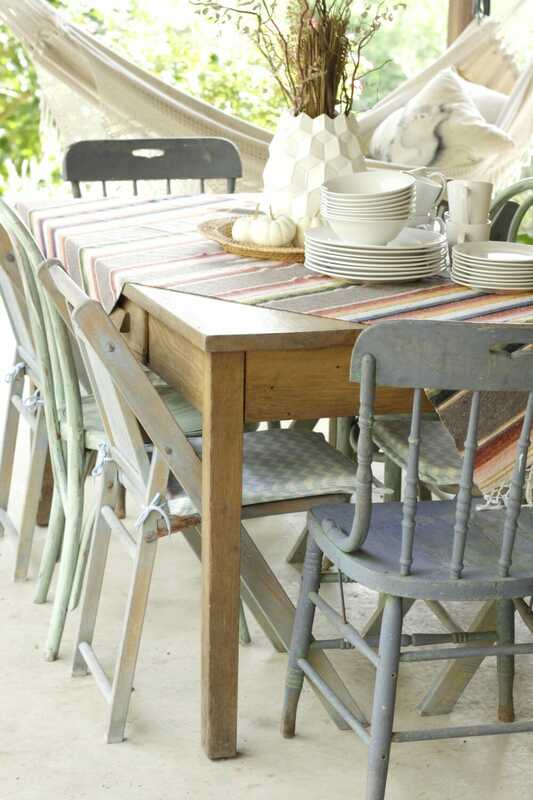 I love the mixed chairs around the table and just seeing the way everyone enjoyed the space. Looks like it was a wonderful gathering! thank you so much, brittany! that is about the nicest comment! It’s beautiful, Cassie!!! So many happy spots to sit and enjoy your spot on the hill. And, what a fun gathering! I’ve always wanted to entertain outdoors like that. thank you so much, shelley! i hope to entertain more in the future! aaaw, thank you! it’s my fave time of year! So gorgeous Cassie! Love every detail! Need to go back and do some pinning 😉 Happy Fall! Your porch looks so pretty Cassie! You should make coffees out there a regular thing! i know! i think i will! Cassie, OH MY GOODNESS! 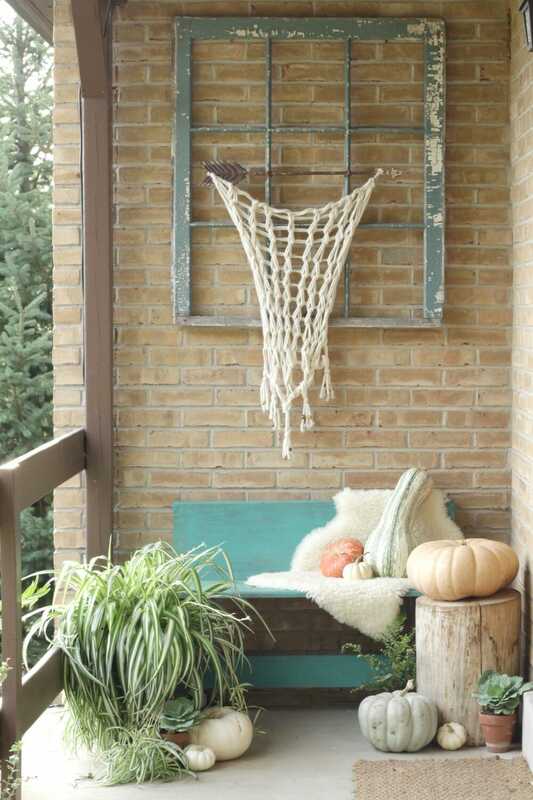 Your porch blew me away for fall! I’m so in love with every little detail and I absolutely love all of the boho and natural touches. I am dying over that skull and corn husk flower! Genius. And I will totally steal it next year (and will credit you of course!). So AWESOME, my friend! Always a pleasure to have you and I so appreciate your unique style. It’s a breath of fresh air! thank you so much, lindsay, and thank you for being an awesome hostess and including me! Beautiful Cassie!! I adore all the plants chillaxing outside. I’m seriously going to swing in that hammock one day. 🙂 LOL! Love all your fall touches . thank you so much, stephanie! come on over. and link at the Fabulous Fall Party! Your porch is so charming Cassie! 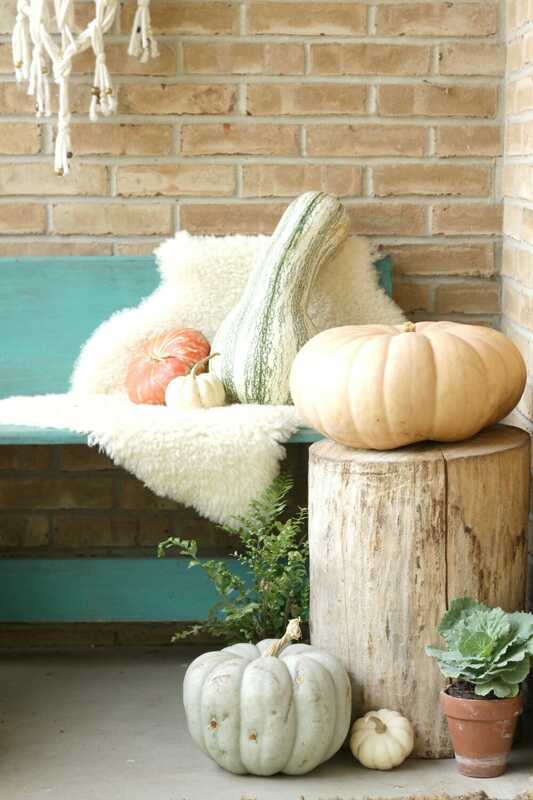 I love your little fall touches but most of all I love you invited friends over to enjoy the space– wish I lived closer (as I’m sure everyone does– but I really mean it!!)! thank you so much, rachel! you can pop by any time! aaaaw, thank you so much! The skull with corn husk flower is EVERYTHING! What an amazing porch!! I want to hang out here! It’s so cozy!! Bravo! Cassie your style is inspiring talented lady! 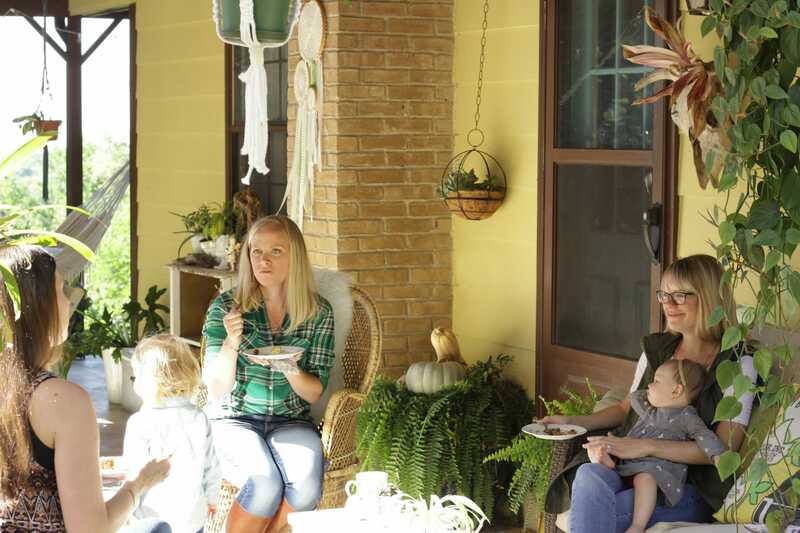 I loved scrolling through each detail and that porch is dreamy… How sweet to see your beautiful dining set up and then all those gathered around enjoying it. I love these kinds of tours and was delighted to get to do it with you! thank you so much, annie! right back at you! love your home! 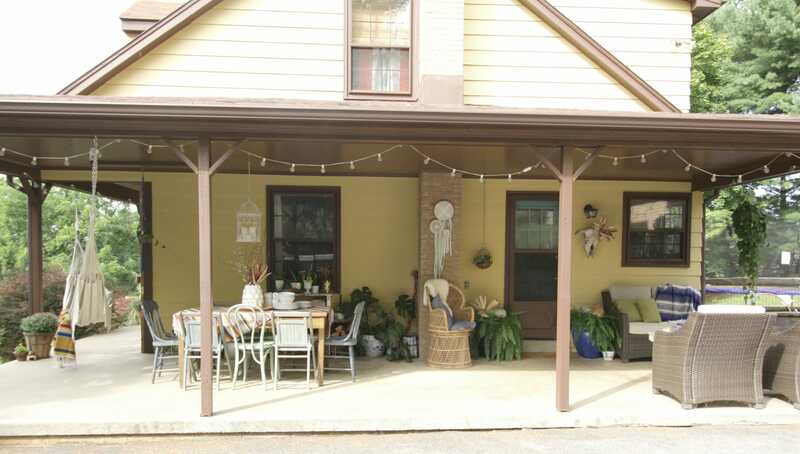 i love having a large porch to entertain- it sold me on this house! and the views and coziness! 🙂 thank you! oh wow! thank you SOOOO much, keila! that is the sweetest comment! happy monday!